Why Are There Fewer Collaborative Divorce Filings? A few years ago, it appeared that collaborative divorce, and its cousin, cooperative divorce, would be the “new thing,” revolutionizing the practice of divorce in Wisconsin. In my column a couple of years ago, I reported a study reflected that while collaborative divorce only represented a small number of filed divorce cases, it appeared to be gaining in popularity and had a reasonably favorable success rate. See Gregg Herman, “Collaborative Divorce Gains Momentum in State,” Wisconsin Law Journal, Nov. 24, 2008. It recently felt like time to update the study — which resulted in some very different conclusions. My office examined two additional years of divorce filings in Waukesha County. We chose Waukesha because it has a sufficient number of divorce filings and collaborative lawyers to make the study meaningful, while not being so large as to make an examination of all divorce filings unmanageable. The raw data we relied up is posted on my office website. 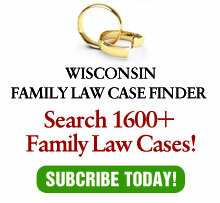 First, for comparison purposes, our 2008 study revealed that over a three-year period, of 3,927 divorce cases filed in Waukesha County, 75, or less than 2 percent, were collaborative cases. Of these 75 cases, eight, or 11 percent, resulted in a breakdown of the collaborative process where the parties had to retain new lawyers. The remainder either resulted in a settlement within the collaborative process or a dismissal, presumably due to reconciliation. Our updated study examined 2,579 divorce cases filed over a two-year period. Of those cases, 35, or less than 1.4 percent, were collaborative cases (we excluded one case with a “collaborative agreement” because one party was pro se, which means the case could not have involved a disqualification agreement). Of these, one is still open at the time of this writing (which is a year and a half from filing – not a good sign). Five cases were dismissed. Of the 29 cases that went to judgement, 24 settled within the collaborative framework. In five cases, or 17.24 percent of the cases that went to judgment, the collaborative process failed. Two aspects of the data are disturbing, for those who believe in the collaborative process. First, the number of collaborative cases is declining, from an average of 25 cases per year to an average of 17.5 cases per year. Second, the failure rate is way up, from 11 to 17.5 percent, an increase of 55 percent. Disqualification is both the key to the collaborative process (which is why when one party is pro se, it is not a collaborative case) and its greatest risk. If the collaborative process fails, the cost to the parties of finding and retaining new attorneys is significant. As a result, the disqualification agreement is designed to encourage the parties to reach an agreement within the collaborative process. The statistics showing the decreasing percentage of cases that elect the collaborative route and the increasingly high failure rate may be related. After all, the failure of a collaborative case hurts not just the client, but the lawyers as well, who lose the client and the future fees and referrals generated by satisfied clients. The maxim “once burned, twice shy” might be applicable here, and attorneys may be increasingly reluctant to sign the disqualification agreement. There are numerous other potential explanations, including a blip in the timing of this study, a failure to adequately train collaborative lawyers and, perhaps, the limited utility of this methodology under any circumstances. Possibly the weakened economy of the past few years has played a role as well, with fewer divorcing couples overall being able to afford legal counsel, either traditional or collaborative; we didn’t pursue that angle in our limited study and it could be a subject for a whole different article. But arguably, the weakened economy – one might think – would lead to more collaborative cases, as it can save the parties money, when there is less money for litigation and less to litigate about. Anecdotally, I can say over the past few years, I’ve had fewer clients elect the collaborative process. It’s troubling to me, since I still believe the process works very effectively in appropriate cases, and I was the founder of the collaborative group in Wisconsin. In any event, numbers don’t lie and the collaborative movement — and those who care about the process — should take heed.